Everything starts with the right knife. 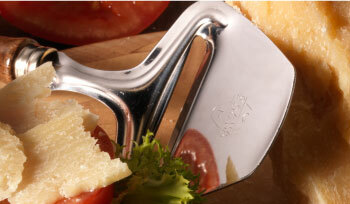 Often described as a “teardrop knife”, this is the perfect tool to cut and serve Grana Padano. Using the point of the knife makes cutting small pieces or chunks far easier. The subtle, delicate cut of the “affettagrana” blade. The “affettagrana” blade (or Grana slicer) allows you to cut ultra thin slices. 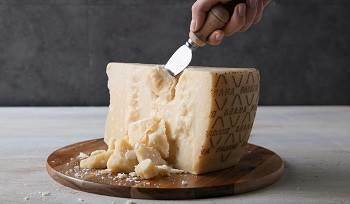 For example, ultra-thin cheese “petals” to be placed on top of your dish, enriching the dish without compromising its balance. The unmistakable style of Italian food heritage. 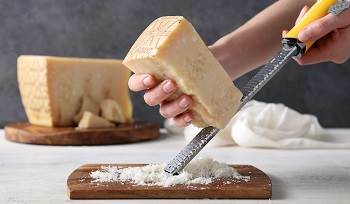 The grater is one of the main tools used to enjoy Grana Padano at its best. This classic symbol of Italian culinary tradition will magically turn its texture into a tasty, snowy powder, which will uniformly settle on your dishes with great decorative effect.